Jesus had entered the town of Capernaum, and immediately gained fame among the people because of His miracles and His teaching. He entered a house to teach those that were in it. But it became so packed with people that Jesus couldn’t move from His place. The doors were opened for people to listen from outside. What a love for Jesus these people were showing by simply packing the house He was in! But there was one who couldn’t enter, but sought Jesus like no other. He was not able to fight through the crowd to get in. He was “the paralytic”. He had been paralyzed for so long that he had become known by his problem. They climbed on the roof of the house, and began taking off the roofing. They labored tirelessly to put a large enough hole in the roof of the house. Then, raising their friend from the ground where he laid on a cot to the roof, they repositioned him, and lowered him down to Jesus. These men believed Jesus for their friends healing so strongly that they worked for it, and yes, expected it. They didn’t plan a way to retrieve the man and the cot back through the roof. Then the most amazing thing happened. Jesus saw their faith. 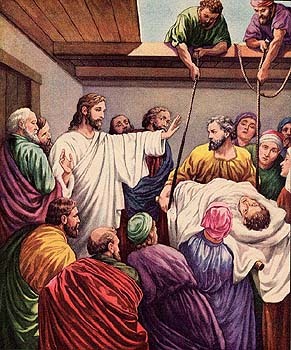 He saw not only the faith of the paralyzed man seeking healing, but the faith of his friends. In Mark 2:5 Jesus says to the man “Son, your sins are forgiven you.” This may seem strange, that Jesus would forgive his sins rather than heal him, but in fact Jesus was healing him - eternally. Unforgiven sin results in death. Romans 6:23 says “the wages of sin is death”. What Jesus gave the man was eternal healing, not just the temporary healing of his broken body. “That you may know”, Jesus said. It wasn’t just about the paralytic. Jesus wanted to heal the scribes as well. He wanted them to see that He was the Messiah, and that He has authority over sin, as God does. The paralytic was healed that day, and to the amazement of those that were there, he walked out of the house standing straight, and packing his cot. But the scribes, unable to put faith in Jesus and believe in the power given to Him, were not. Faith works healing in ways that we don’t have to understand. Faith is placing your trust in Jesus’ power as the Son of God. It can provide you with the eternal healing Jesus gave to the paralytic. In Matthew 28:18 Jesus speaks to His disciples after He had risen from the grave. He said “All authority has been given to Me in heaven and on earth.” He has all authority – all power. Nothing is beyond the reach of Jesus. There is no miracle He cannot work, no disease He cannot cure, and no sin He cannot forgive. When you’ve lived with a problem for so long that you’re known by it, know that Jesus heals. All it takes is faith to believe in Him. He did it all “that YOU may know”.